Sarah Smith and Jo Coburn's guests are Sir Alan Duncan MP and Yvette Cooper MP. The political panel consists of Isabel Oakeshott, Matthew Zarb-Cousin and Lucy Fisher. Browse content similar to 18/03/2018. Check below for episodes and series from the same categories and more! to the Salisbury poisoning case. where will this crisis go next? are potentially linked to Russia? the Home Affairs Select Committee. on Labour's all-women short lists? appears to be on hold. they need to get back on their feet? All that coming up in the programme. pointed firmly in one direction. there and then we'll talk about it. to the Commons to update MPs. be kicked out of the country. and truly in the deep freeze. won her some new fans. away, it should shut up. Go away, it should shut up. the use of a nerve agent. attack to run its own tests? It's a very sad situation. the Russians were behind it. Today is election day in Russia. action the government will go in. These are quite short-term measures. a much wider, long-term problem. actions until they were proved. the Kremlin is a misunderstanding. it is a false dichotomy. flak for his response this week. convinced this is state directed? equivocal as perhaps you suggested. chemical weapons, has been violated. weeks ago. -- you wear minister. some of the other parts of the act. to this attack, would it? human rights violations in the bill. what you have just described. to tackle corrupt money in London. of "compression to the neck"
at his home on Monday. of Sergei and Yulia Skripal. able to cover new evidence? at these other cases as well. involved in some way or another. together to focus on as well. what those measures should be. and that is shared across the house. of a type developed by Russia. the pressure to be who I was. she wants to make political history. don't seem to be worried. "transgender and the war on women". as transphobic, a label they reject. would be insulting to her. we are blurring the distinction. but those views got her suspended. but makes no apology for it. but you do have to listen to us. in the autumn but nothing surfaced. in due course, but no date given. as little surprise to some. I will just be who I am. had to put it off until June. and kicking it into the long grass. and being on a women's short list. the film, there may be several. welcome to have a consultation. difficult one for the government. 3000 people in a party of 650,000. It is a rounding error. Labour Party, you're talking about? believe in trans-rights, that's it. and she didn't have to do that. you're watching the Sunday Politics. 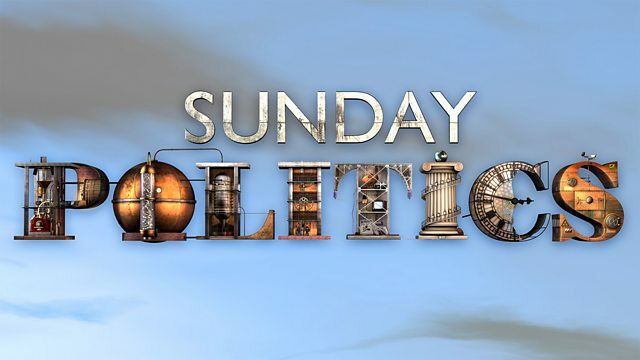 the Sunday Politics where you are. the London part of the show. a minister in the Foreign Office. the problem of knife crime. to raise this as an area of concern. trauma that young people are facing. number of knife crime incidents. None of that is entirely reliable. out would be a sensible first step. How bad is it in Lewisham? strategies that are just four years. hope we will be able to act on it. We will follow it then. is also facing a serious downturn. area to make a recovery? People seem to be keeping away. here so close to Grenfell Tower. 40, 50, 60 feet high. There was a smell, you know. and the smell of plastic. who have been keeping away. in 12 weeks to 15 weeks. and you've got to look forward. and to get them back on their feet. of that is about £200,000. by a large decant of people. with the business needs either. affected in a wider area. for years, it was great fun. is the advent of change. is the advent of chains. lasting than the fire itself. given on a continuing basis? like a bit of an extension? be more proactive at City Hall then? otherwise they will die off. are happy with as well. it's not good enough, is it? of its kind in Europe. of its estimated 555 male detainees. for over four and a half years. Those conditions are a disgrace. day time limit under tension. between, let's say six months? but we need to get it sorted out. officers so they are kept track of. whether they should be detained. detained in such an inhumane way. what would you do to these people? hold people in this way? in a tighter and quicker fashion. worse than prison. Is it defendable? underground and difficult to detect. exception, that's not the case. it there, back to Sarah. Brexit Select Committee of MPs. Hilary Benn and he joins me now. be set out by October? is during the Article 50 period. as not leaving the EU. referendum decision has been made. in order to keep minds focused. what everyone says they want. Brexit this week with the panel. have us begging for more time here. remain in the customs union. on getting the deal done? Parliament try and cause us to cave. That is a difficulty government has. we just stay in the. Hilary Benn are still on the set. at 11am here on BBC One. Sarah Smith and Jo Coburn's guests are Foreign Office minister Sir Alan Duncan MP and chair of the Home Affairs Select Committee Yvette Cooper MP. The political panel consists of political journalist and commentator Isabel Oakeshott, former adviser to Jeremy Corbyn Matthew Zarb-Cousin and senior political correspondent for the Times Lucy Fisher.